So it was, and we walked away dejected but – as good Americans – respecting the law as it was currently written. These laws were humiliating, hurtful, and legally damaging. For LGBT Christians, Jews and other people of faith these bigoted obstacles to marriage equality desecrated their sincerely held religious beliefs. However, our values and beliefs meant little more than a heap of garbage to our foes on the Religious Right. With moral certitude, they proclaimed, “the law is the law” and if you don’t like it, change the law or leave America. The anti-gay extremists were correct. In a free and orderly nation there is a process to petition for altering laws. LGBT advocates spent millions of dollars fighting for equality. We had to endure painful and emotionally trying referendums that lied about our lives and essentially put our families on trial. Putting our most basic rights up for a vote was a grotesque perversion of democracy – and I wish it on no other group of people. We also took the prohibitively expensive route of the courts, because these discriminatory and unconstitutional laws are based on pure anti-gay animus and serve no legitimate societal purpose. This drained our personal time and money. It put us on a slow, laborious path while our relationships remained stuck in a bizarre state of legal limbo. Many LGBT people saw a partner die before the legal process played out. Not only did they endure the trauma of losing a loved one, but in the midst of mourning had to suffer though unbearably cruel legal obstacles that treated these couples as if they had been strangers. Still, we soldiered on against incredible odds. We lost referendum after referendum, where our neighbors went to the ballot box to invalidate the very core of our existence. We marched door-to-door, in often-inclement weather, to persuade the community that our relationships were worthy of dignity and respect. During this entire period, our opponents assured us that we were in a culture war. Both sides would fight hard within the framework of the law. There would be winners and losers. These fundies must be terribly confused. They live in the United States of America, not “The United States of God.” They aren’t special and will have to follow the rules, just like we did. 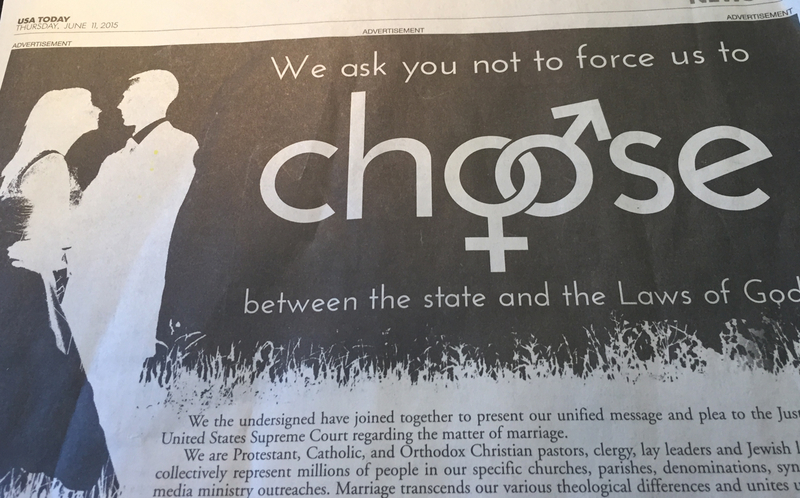 It’s instructive that these fanatics had no issue forcing pro-LGBT religious congregations to choose between oppressive state marriage laws and their “laws of God.” Hypocritically, it seems that the only people that truly matter are fundamentalists. As far as these intolerant demagogues are concerned, democracy and religious liberty are merely convenient tools that are cynically invoked to their political benefit. The moment they begin to lose they start to make threats, pretend to be martyrs and victims, and work feverishly to undermine and delegitimize key American institutions, such as the courts. This un-American declaration of mutiny is disgraceful and traitorous. The U.S. is not the Christian version of Iran and these rebellious malcontents do not get the special right to obey only the laws they fancy. What they are truly demanding is a state of chaos and anarchy. Our opponents understand that the vast majority of Americans heartily reject their phony plea that America is a “Christian Nation.” Thus, they can only achieve their nefarious goals through coercion, confusion, cheating, and force. Don’t be fooled by the tantrums and tirades. 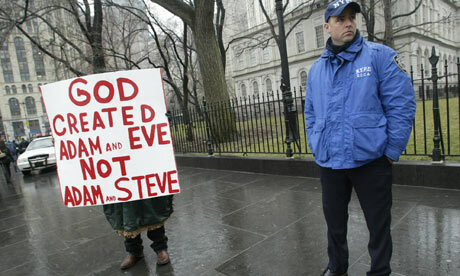 No one is compelling any of these bigots to gay marry. No one is forcing them to violate their so-called consciences and perform gay weddings. They are simply sore losers who are apoplectic because they may be losing their ability to wantonly violate the consciences of others with impunity.